This ladies Limit 2-piece watch and bracelet set oozes femininity with its shiny, elegant design. The crisp white dial helps to keep time effortlessly whilst the clear stone accents set in the bracelets add an eye-catching sparkle to make any outfit come alive. This gorgeous double-set would make an exquisite gift. 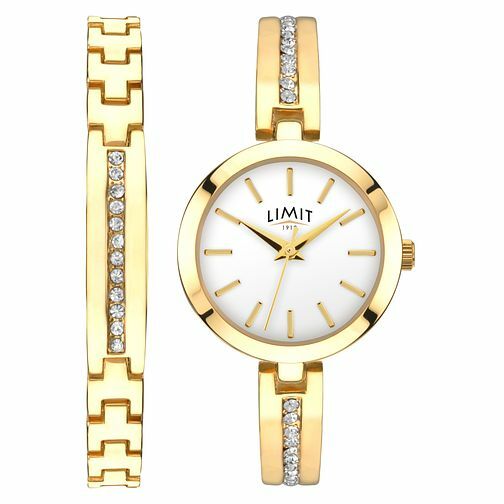 Limit Ladies' 2-Piece Gold-Tone Bracelet & Watch Set is rated 4.8 out of 5 by 4. Rated 5 out of 5 by Anonymous from Limit 2 piece set I was very surprised at the quality of this watch and bracelet set. It looks really stylish on your wrists. It was so easy to get it sized at Samuels. I loved it that much I bought another set for my daughter. Rated 5 out of 5 by Anonymous from I like the product. Simply good value of money. Product is very stylish as well.